Oh man, the week I’ve had! Young sir has decided to give up on sleeping. I think this is the start of him trying to impose his own influence, but hopefully soon he’ll realise that actually sleep is good! I don’t think Saturdays used to have a 5:30am, and if they did they certainly weren’t made for watching Toy Story! But this week I have managed to make my Christmas cake. It is a really easy mixture which stays beautifully moist when baked and it doesn’t need to be made months in advance, a few weeks is plenty of time. Perfect for anyone who doesn’t like to think about Christmas in July! At this point I’m going to admit that I cheat with my ingredients. There: I admitted it! But it’s just a little cheat that makes life a bit easier. Instead of weighing out all the different dried fruits, I just use a 500g bag of mixed dried fruit. There are different mixes available so just choose one you like the sound of! 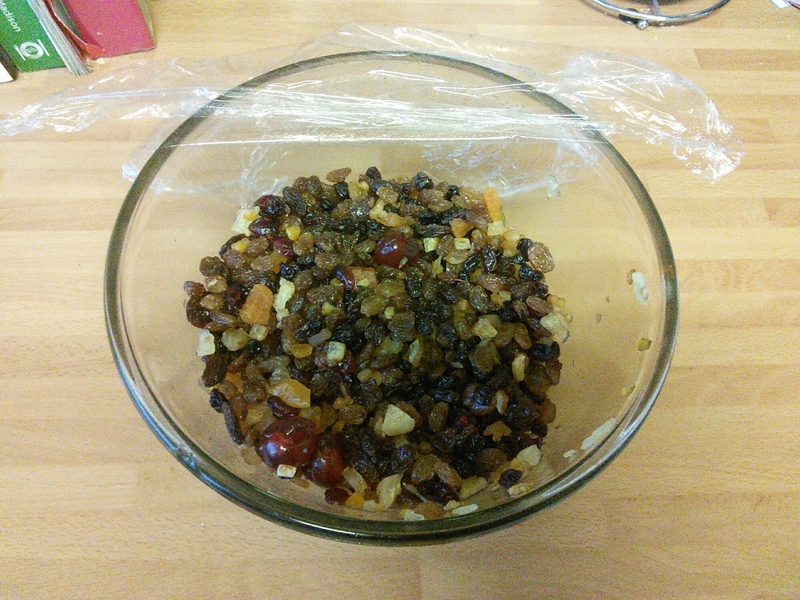 Start by putting the dried fruit (currants, sultanas, raisins, cherries and mixed peel) in a bowl with the brandy and leave to soak overnight. If you wish you can substitute orange juice for the brandy. Cover the bowl with cling film and leave at room temperature. Next day start by preheating the oven to 180°c. Cream together the spread and sugar and once combined add the freshly grated lemon zest and stir. In a separate bowl mix the flour, bicarb, cinnamon, nutmeg, mixed spice and salt. And measure out the soya (or other) milk in a jug. Add a little flour and a little milk to the sugar mixture and mix until combined (a few small lumps are ok, don’t over mix!) Repeat until all the flour and milk is incorporated, then add the soaked fruit and stir. Put your cake in the oven and set your timer. In my oven my cake takes about 2 hours to bake in total, but I like to check on it after roughly 60, 90,105 minutes to see how it’s getting on. As with any other cake it is fully baked when a skewer or knife comes out clean. 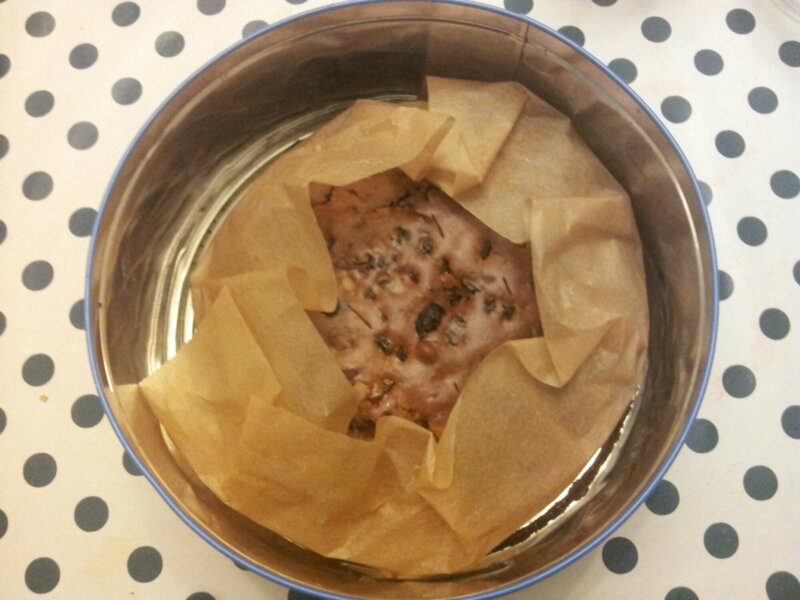 Once baked allow your cake to cool completely, still wrapped in the lining paper from the tin, before storing in an airtight container. The cake will need fed roughly once a week from now until Christmas. To do that, take your skewer and poke a few holes in the surface of the cake. Then drizzle over 2 or 3 spoonfuls of brandy, before covering your cake again and putting it back in its container. Then in no time at all it will be the last few days before Christmas and time to add the icing!